Washington, D.C., June 1, 2017 – President Jimmy Carter entered office in 1977 determined to draw down U.S. forces in South Korea and to address that nation’s stark human rights conditions, but he met surprising pushback on these and related issues from both South Korean President Park Chung Hee and his own top American advisers, as described in declassified records published today by the National Security Archive at The George Washington University. At the same time, senior U.S. officials including Cabinet officers tried to put the brakes on U.S. troop withdrawals and other policy initiatives such as holding tripartite talks with the two Koreas. Deputy Assistant Secretary of Defense Michael H. Armacost complained to Defense Secretary Harold Brown before the summit that the latter was a “lousy idea,” a “loser” and “gimmicky.” The president faced similar resistance from a range of American officials on the ground in South Korea. By Robert A. Wampler, Ph.D. It should be no surprise that events on the Korean peninsula have presented early challenges for the Trump administration. History shows that the combination of North Korean provocations and South Korean political crises has repeatedly confronted the U.S. with difficult policy choices. Previous electronic briefing books posted by the National Security Archive have addressed the limits of military options against North Korea [see EBB 322], the difficulties in understanding Pyongyang’s actions and goals [see EBB 421], and U.S. efforts to rein in South Korea’s nuclear weapons program [see EBB582 and EBB584]. For the Carter administration, the rocky course of Korean relations moved from the deep divide between Seoul and Washington created by Carter’s determination to withdraw U.S. forces and his criticism of Park Chung Hee’s human and political rights abuses, to the assassination of Park and subsequent military coup, followed by the rise of coup leader Chun Doo Hwan to the presidency and U.S. concerns over his authoritarian regime centering on the looming execution of South Korean political dissident Kim Dae Jung. The historical backdrop to the documents posted here today can be sketched quickly. 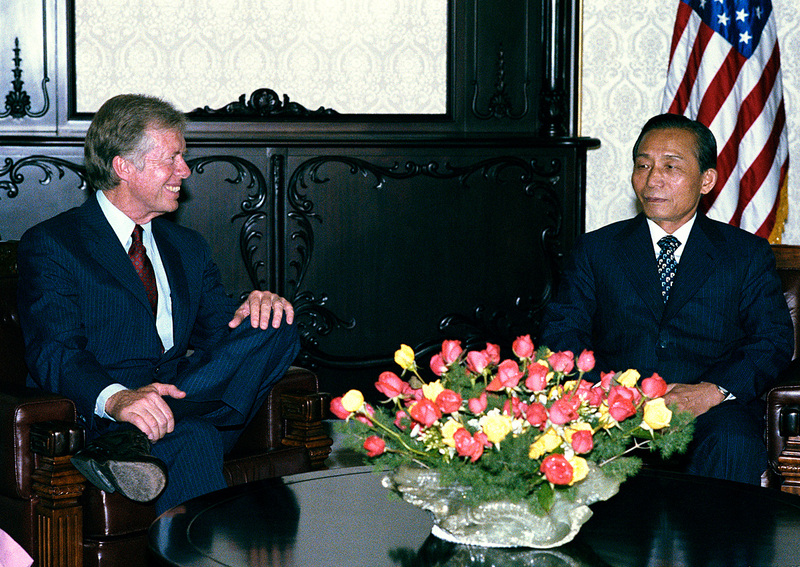 President Carter entered office in 1977 determined to draw down U.S. forces in South Korea, and deeply concerned about Park Chung Hee’s suppression of political opposition. Both of these issues imposed immense strains on the alliance during Carter’s term in office. Carter faced significant push-back on the troop withdrawal issue not only from Park, but also from his senior advisors, particularly his secretaries of state and defense, as well as senior U.S. military officers in Seoul, who seized upon new intelligence estimates that showed a much stronger North Korean military capability to argue against thewithdrawals. Park would have little time to take any steps to address U.S. concerns, however, for on October 26, 1979, the director of the South Korean CIA would assassinate him during a dinner which was marked by intense and bitter arguments over Park’s handling of political discontent. In the aftermath of the assassination, once the identity of the assassin was determined, U.S. concerns centered on ensuring that this shock to the Korean political system did not result in political instability that could undermine democracy or tempt North Korea to further shake up conditions on the peninsula. Hopes for an orderly political transition were dashed, however, when a group of “Young Turk” South Korean political officers, led by ambitious Korean Army general Chun Doo Hwan, staged a coup on December 12. In its aftermath, the limits on U.S. ability to influence political events in South Korea become ever more evident, as Chun, using his authority under martial law, imposed his own crackdown on political dissent, including the arrest of Kim Dae Jung, which was the spark that set off the May 1980 Kwangju uprising. The Chun regime brutally put down this uprising, and many South Koreans still see the U.S. as complicit in the crackdown because of claims made by the Chun government of U.S. support. Kim Dae Jung would be sentenced to death for his alleged role in fomenting the Kwangju uprising, and U.S. efforts to secure leniency for Kim would drive much of U.S. diplomacy with the Chun government (Chun, despite denials of political ambition, would be elected president in August 1980) until the end of the Carter presidency. It would be left to the incoming Reagan administration, which entered office determined to restore the alliance relationship, to finally secure commutation of Kim’s sentence. The documents posted here today come primarily from the Pentagon records of Secretary of Defense Harold Brown, and are supplemented by documents from the Digital National Security Archive collections on U.S.-Korean relations, as well as files obtained from the U.S. National Archives. As secretary of defense, Brown had the unenviable task of being Carter’s point man on defense issues in dealing with Park and then Chun. His role was to advance U.S. policy goals that were less than attractive to the South Korean leadership, as well as to advise President Carter on policy options that the president would find less than ideal. *Thanks to Bill Burr for his assistance, especially for providing copies of documents 1 and 16. On the impeachment and arrest of Park Geun Hye, see “South Korea Removes President Park Geun-hye” by Choe Sang-Hun March 9, 2017; and “Former South Korean president arrested in corruption probe, 3 weeks after impeachment,” by Anna Fifield, March 30, 2017, The Washington Post. On the election of Moon Jae-in, see “South Koreans elect liberal Moon Jae-in president after months of turmoil,” by Anna Fifield, May 9, 2017, The Washington Post, and “On first day in office, South Korean president talks about going to North,” by Anna Fifield, May 10, 2017, The Washington Post. On Trump and his administration’s response to North Korea missile tests and possible new nuclear tests, see “Trump’s North Korea Standoff Rattles Allies and Adversaries,” by Robbie Gramer and Paul McLeary, April 20, 2017, Foreign Policy. The U.S. is pursuing ballistic missile defense systems as one possible way to respond to North Korea’s nuclear and missile ambitions in a way that is not dependent on diplomacy or sanctions; see “Missile Defense Test Succeeds, Pentagon Says, Amid Tensions with North Korea,“ Helene Cooper and David E. Sanger, May 30, 2017, The New York Times. A good narrative history of the troubled course of U.S.-South Korean relations during the Carter years can be found in Don Oberdofer’s The Two Koreas: A Contemporary History (Basic Books, 1997, 2001), in particular Chapter 4: The Carter Chill, and Chapter 5: Assassination and Aftermath. Unless otherwise noted, this summary of the period draws upon Oberdorfer’s account. In addition to Oberdorfer, Chapter 4, a good overview of the issues surrounding U.S. forces in South Korea can be found in William Stueck, “Ambivalent Occupation: U.S. Armed Forces in Korea, 1953 to the Present,” in Trilateralism and Beyond: Great Power Politics and the Korean Security Dilemma During and After the Cold War, edited by Robert A. Wampler, Kent State University Press, 2012. As this essay shows, other presidents besides Carter have wanted to reduce the number of U.S. troops in South Korea, but political and strategic considerations have conspired to thwart these desires. See “The Secret ‘Swing Strategy’,” TheWashington Post, October 8, 1979. Oberdorfer, The Two Koreas, p. 119. Pete Dawkins was a highly decorated U.S. Army officer and business man who was very well known by the late 1970s. He attended West Point, where he won the Heisman Trophy while playing for the Army football team (which he also captained), was president of his class, graduated with high honors and won a Rhodes scholarship, before embarking on a military career. Serving in Vietnam, then holding command positions in the U.S., he rose quickly through the ranks to retire in 1983 as a brigadier general. He also served as a White House Fellow in 1973-74. Following his retirement from military service, Dawkins began a successful business career involving senior positions at financial firms, including Lehman Brothers. In 1988 he made an unsuccessful bid for a Senate seat from New Jersey, running as a Republican; for further details on his career, see “Pete Dawkins,” Wikipedia article, https://en.wikipedia.org/wiki/Pete_Dawkins.